"Patriotism and feminine persuasion herded thousands of men into the confederate ranks early in 1861, but army life lacked virtually all the glories so widely proclaimed. Camps were dreary, monotonous places, filthy, frequently boggy, and always unhealthy. Men soon found that they wasted away from ennui, measles, "flux," and all the timeless ills of armies. With the hard fact of camp life came a wary wisdom, and many Johnny Rebs cautioned friends to spurn the false attractions of glory." -Frank E. Vandiver-southern historian. Fernandina and on Monday the 8th day of July 1861 he enlisted as a Private in Captain Call's Company, Florida 2nd Infantry Regiment.. They rendezvoused with 10 other Florida Companies at the Brick Church just west of Jacksonville, now known as La Villa, and on Saturday, July 13th, 1861 they were mustered into the Confederate service by Major W. T. Stockton. This company subsequently became Company K (The Davis Guards of Nassau County), Florida 2nd Infantry Regiment. On Monday, July 15th the Regiment left by rail for Virginia, arriving in Richmond Sunday afternoon, July 21st. The Regiment was in Camp of Instruction,5 in the neighborhood of Richmond, for nearly 2 months. On September 17,1861 the Regiment left Richmond for Yorktown. During the fall of 1861 and the following winter the Regiment was encamped near Yorktown, forming a part of the Army of the Peninsula under the command of Maj. General J. B. Magruder. With the beginning of spring began the advance of the Union Army under General McClellan. throwing the enemy into a hasty flight, enabled us to effect, with little loss, an enterprise of great hazard, against a superior force supported by artillery, when the least wavering or hesitation on our part would have been attended with great loss. "-as told in a report by General Magruder.--Confederate Military History Extended Edition-- Broadfoot Publishing Company, Wilmington, NC, 1989. 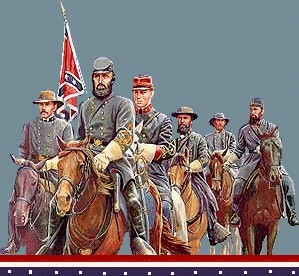 Their next battle was the battle of 2nd Bull Run, August 28-30, 1862. This appears to be his last major battle because on September 9th, 1862 he asked for his discharge and it was granted at Fredrick City, Maryland. He was paid back pay for 6 months and 9 days at $11 per month($69.30), Transportation @ $.02 per mile to Gordonsville, Virginia(100 miles =$2.00) and a clothing allowance of $25 for 6 months and $7.92 pro rata for rations. This all came to $104.22 and was paid in full on September17, 1862. One of the questions that need to be answered is, "Why did Ephraim choose to ask for his discharge at this point in time?" His enlistment was up on July 8, 1862, having completed the year that he volunteered for. Did he ask for his release because he didn't want to invade his homeland. Maybe he did ask for release on July 8 and was refused due to the Subscription Act that stated that all volunteers that wanted out could not do so until they had a replacement to take their place. Maybe; as the story is told; he met and fell in love with a volunteer nurse during his hospitalization when he was wounded. This nurses name was Mary Charlotte Wright. The reason that he asked for his discharge at this time will never really be known, but one thing we all must remember is "None but heroes are left".